Come affrontare il problema della tratta umana transnazionale di donne nigeriane in Italia a scopo di sfruttamento sessuale? The ROOT (Research on Organised Trafficking in Human Beings) study was set up to investigate on the extent of the phenomenon of trafficking of Nigerian women in Sicily and beyond. According to the 2014 Working paper issued by EUROSTAT on Trafficking in Human Beings, In 2012 Member States reported a total number of 10 998 registered identified and presumed victims. Over the three years 2010-2012, 30 146 victims were registered in the 28 Member States. the majority (69%) of registered victims were trafficked for the purpose of sexual exploitation, 19% for labour exploitation and 12% for other forms of exploitation such as the removal of organs, criminal activities, or selling of children. Over the three year period covered by the data, the top five countries of citizenship within the EU, in terms of absolute numbers of registered victims, were Romania, Bulgaria, the Netherlands, Hungary and Poland. For non-EU citizens, the top five countries were Nigeria, Brazil, China, Viet Nam and Russia. According to the Commission Staff Working Document “Mid-term report on the implementation of the EU strategy towards the eradication of trafficking in human beings” – COM(2014) 635 final, progress has been made across the EU since 2012 in identifying, protecting and assisting victim of trafficking; stepping up the prevention of trafficking; prosecuting traffickers; and in the coordination, cooperation and policy coherence. However, more still remains to be done. 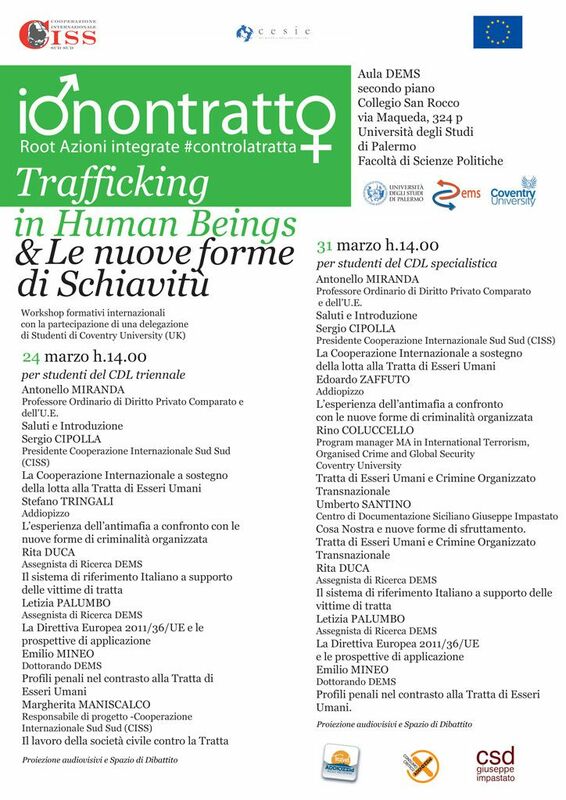 In this framework, the ROOT study (2013 – 2015) presents an innovative approach to the phenomenon of trafficking of women in Italy, and in particular in Sicily. So far, formal investigations have only been linked to individual cases of abuse or as a follow-up to victims formally denouncing their conditions. But an extensive research on the global phenomenon and its interactions with organized crime in Nigeria and Italy has never been carried out so far. In the first year, the lead partner has carried out a research, aimed specifically at discovering the links between trafficking in Sicily and organized crime networks. The second part of the study entails awareness raising and information sessions for different local stakeholders, who are being informed about the phenomenon and learn how to distinguish trafficking victims who are being exploited sexually. 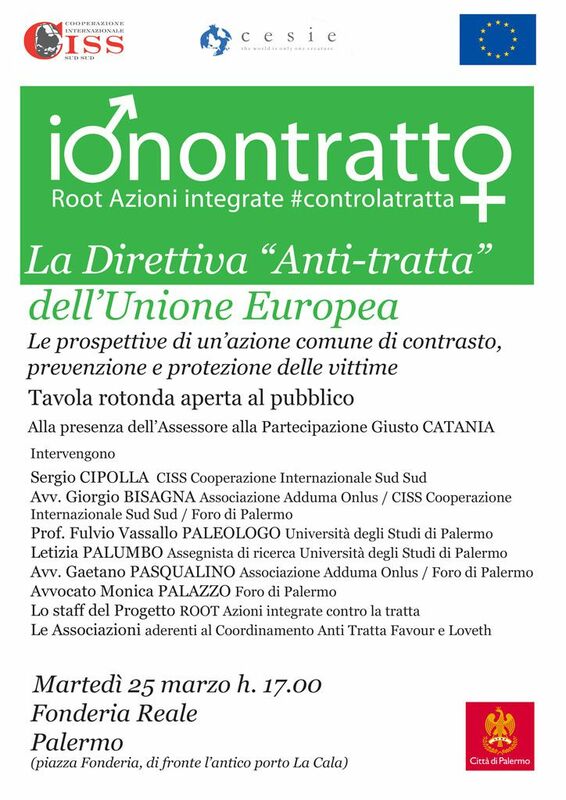 Empowering the local community, and extending the knowledge on transnational crime, the ROOT study partners hope to help fight this phenomenon, also thanks to the local network of associations fighting against trafficking called “Coordinamento Anti tratta Favour e Loveth”. Research on trafficking of Nigerian women in Sicily and the role of organized crime.